Size: 36" x 24" - Fits Standard Frames! 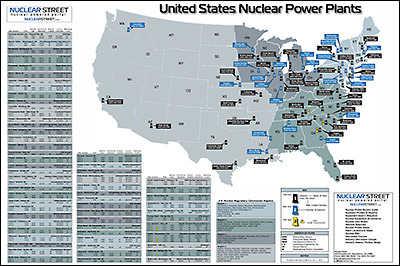 Nuclear Street Wall Maps show the location of each commercial power reactor that is currently in operation. Along with the location, the table includes each reactor’s generating capacity (MWe), reactor type, date of commercial operation, reactor supplier, license expiration, and the operating cycle. On the map you will find the location of each reactor and the phone number for every plant. The map is organized and color coded by NRC region. Get quick information - Plants listed in alphabetical order! All maps are printed on heavyweight paper and mailed "rolled" (unfolded) in shipping tubes. Buy multiple maps - NO ADDITIONAL SHIPPING! Expedited shipping available, contact us toll free at 866-966-9640, ext. 1 for additional shipping charges or ANY questions.